There is a school of thought that goes out of its way to excuse the garish excesses of Doctor Who Christmas specials on grounds that they are, well, Christmas specials. These are the same apologetic members who have indulged the worst of the Russell Davies era, an overabundance of silliness, visual chaos, and Disneyesque non-narratives. In their heart of hearts I suspect some of them confess the truth: that The Runaway Bride (2006), Voyage of the Damned (2007), The Next Doctor (2008), and The End of Time (2009) are so bloody awful they could turn a saint into a scrooge, quite amusingly, the opposite of their intended effect. Steven Moffat, however, is not Russell Davies, and the special he has served up this year is a gem. Gone is the usual cacophony and in its place a brilliant spin on a splendid classic, with plenty of soul. Though I tend to think Scrooge gets a bum rap, and I'm certainly no fan of the holiday season, there's something about A Christmas Carol I've always found endearing. It has little to do with Christmas per se, about which Scrooge's opinions actually have considerable merit. Dickens' story, at heart, is about a bitter man who wants to be happy but can't do so without taking a hard look behind, beside, and in front of him. That's a story for any season -- and one that happens to work perfectly in a Doctor Who context. 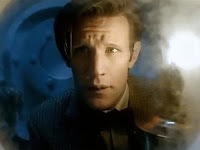 Our Time Lord hero fills the roles of the ghosts of past and future, while sidekick Amy Pond appears as a hologram shade of the present, and between the two of them, with a little help from a dying woman, they manage to liberate a tormented man. That in the process they save over 4000 people from dying at this man's whim is almost ancillary. 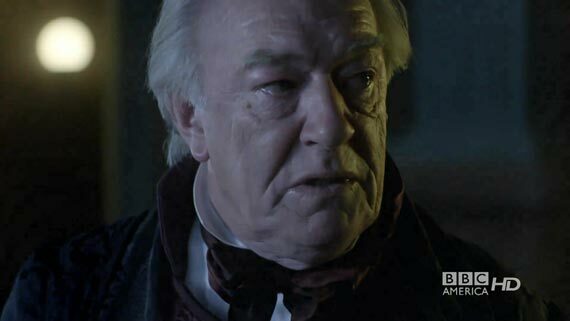 The tormented Scrooge character is Kazran Sardick, an industrial overlord who despises all forms of good will, played brilliantly by Michael Gambon who channels even a bit of Albert Spica. Kazran is that grim (if not quite as oafish and vulgar), and I dare say this is Gambon's best performance since the infamous one in The Cook, The Thief, His Wife, and Her Lover. For him, unlike Spica, there is redemption in sight, though at serious emotional cost as he comes to terms with himself and the scars left by an abusive father. As for the Doctor, he's in top form, and at his most scheming. Frankly he hasn't been this manipulative since The Curse of Fenric, when he used Ace as a pawn and put her through sheer emotional hell. Though he tried to save as many people as possible in carrying out his personal vendetta against Fenric, there is no reason why he couldn't simply have taken the flask he trapped Fenric in and dumped it in a black hole like he did with the deity-skull in Image of the Fendahl. Likewise, in A Christmas Carol, there's no reason he couldn't have gone back in time to prevent the Starliner from taking off in the first place instead of jumping through hoops to rewrite a man's life on the slim hope that he'll change his mind. As in the Fenric classic, there's a part of me that thinks the Doctor is getting off on using people as pawns, rewriting their lives, as Kazran rightly charges, "to suit himself". "I never thought I would be moved by seeing a woman singing 'In the bleak mid-winter' to calm a hungry Jaws-style Doctor-chasing shark lost in the fog. For a scene that on every rational level ought to have been ludicrous, it was astonishingly affecting. In a sense that stands as a paradigmatic miniature of the whole project. This episode manages both more powerfully and more naturally the kind of emotional payload that Moffatt strained after (rather ineffectually, I thought) in The Beast Below." That, incidentally, is a good comparison. While The Beast Below was decent (I gave it 3 stars), it was undercut by a lack of emotional payoff (unlike Abigail in A Christmas Carol, none of the kids who fall to the beast actually die) and a true sense of menace (after the opening scene, the Smilers weren't terribly threatening). Kazran is menacing on multiple levels. Not only will he let thousands of people die because he doesn't care enough to pull a switch, but there is a personal menace owing to inner demons. His transformation on account of Abigail, engineered by a master-manipulating Doctor, is so convincing, and I'm not sure whether that owes more to Michael Gambon's brilliant acting talents or the amazing script. Both are in full force as we see Kazran's nastiness crumble and give way to joy and inner peace, and he and Abigail share her last day of life together. In this sense, A Christmas Carol is a character piece -- a welcome change from the alien invasions of other Christmas episodes -- a lot like Dalek, Father's Day, Amy's Choice, and Vincent and the Doctor. That's pretty classic company, and Moffat's special is classic indeed. By some coincidence, I re-watched The Runaway Bride last night. And I still really like it! I have to say I think your idea that in my heart of hearts I really don't sounds nothing so much like an atheist telling me "But you don't really believe that do you?" It's almost worrying, then, that I agree with you about this year's Christmas special. It was, indeed, very good. And thank you for your review. And thank you for yours. 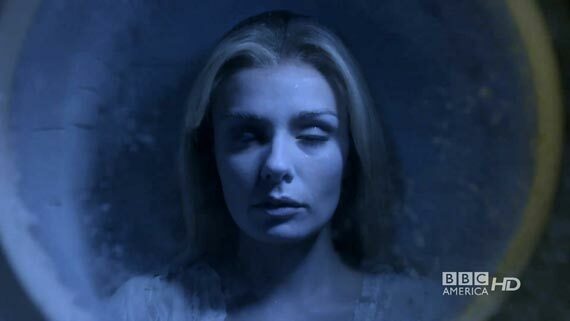 I never dreamed that a Christmas special could be so good that only two stories from the previous season (The Time of Angels/Flesh and Stone and Amy's Choice) surpass it. Thanks for your review, Loren. I must admit that I didn't like this episode much when I watched it on Christmas day. It didn't work as well as some of the others given all the Christmas day distractions -- family, noise, drink, snoozing. It was a bit too heady. I watched it with my nieces and it didn't do much for them. Many others I talked to in England over Christmas felt the same way. However, the good news is that the episode is a real grower. I recently got the chance to watch it for a second time in the quiet of my own home, with full concentration. And it turns out that it is excellent, after all. I am greatly relieved. In Moffat we can still trust! I'd put it at about 4/5, so I am similar to you on this one, Loren. I don't agree with you for a minute on the other Christmas specials, though, which have been lots of fun. My favourite is Christmas Invasion, closely followed by Voyage of the Damned, but this one is up there with them. Agree with Doug about your hilariously impertinent comment that those who claim to like particular episodes don't really like them because you don't! Hey Mark, I'm glad you've seen the light! Or at least you've seen it at one end -- you still haven't appreciated how bad the other specials are (Christmas Invasion being the lone exception). But yes, this one is a real gem. I'm looking so forward to the sixth season.